A pike from the past. 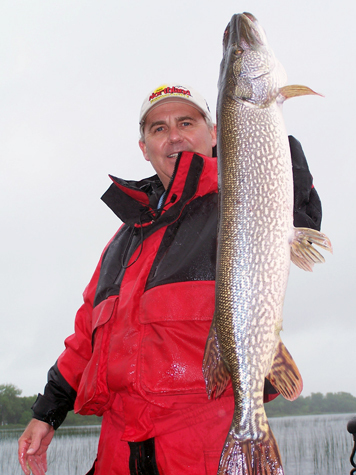 It was a good number of years ago when John Peterson and Bob Jensen got together on Upper Red Lake to bring a bunch of northern pike like this one to the net.A pike from the past. It was a good number of years ago when John Peterson and Bob Jensen got together on Upper Red Lake to bring a bunch of northern pike like this one to the net. For many fisher-people, netting the fish on the end of their line is about the last thing they think of: There are so many other things that we need to do to get to that point. First you’ve got to find where the fish are. Then you’ve got to select the proper bait that will get them on the end of your line. After that happens and the hook is set, you have to play the fish properly. You’ve got to have a good knot and strong line, and you’ve got to have your drag set properly so it will give a little but not too much when the fish wants to run. Then, once you’ve got it tired out, you need to land it. You can swing it into the boat or onto the shore, you can grab it with your hand, or you can net it. Many, many fish are lost when the angler tries to land it. If you want to increase your odds of landing that fish on the end of your line, you need to net it. Here’s why. Swinging a fish into the boat or onto the bank usually isn’t a good option, although lots of people do it. Sometimes when we’re fighting the fish we underestimate its size. When you try to swing a too-big fish into the boat, lines and rods break. 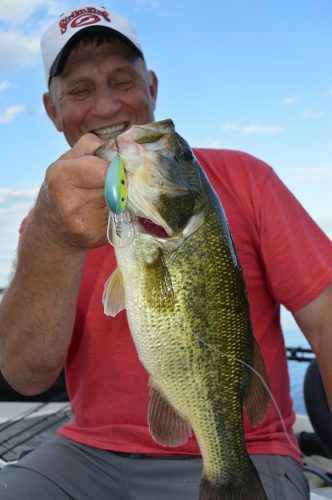 Even if the fish is of swinging size, frequently the hook pops out. Sometimes the fish lands in the boat, but it’s flopping around on the floor. That’s not good for the fish. And, when the hook pops out, sometimes it slingshots into one of your body parts. That’s not good for you. Sometimes the fish lands on the deck of the boat or on the shoreline and flops back into the water. If you were going to release the fish, that’s no big deal, but if you were going to include him in your supper, you’re out of luck. Swinging a fish into the boat is not the best idea. Landing the fish by hand works ok for some species, but you’re increasing the odds of getting a hook in your hand, and again, that’s not much fun. Also if you land a fish by hand, you’ve got to really play the fish out, and that decreases its chance for survival if you release it. The best way to land a fish is with a net. So, now you’ve got that fish within netting distance. Don’t reach or over-extend to land it. You want to get it coming in your direction, and you want it to go into the net nose first. Never try to land a fish tail first: Fish can swim faster than you can move the net. If you try to net it tail first, it will swim out of the net. If you’ve got someone who’s new to netting, show them how it’s done on the first fish, then have them net every fish that comes into the boat that isn’t on their line. It’s good practice, and it keeps them interested even when they aren’t catching the fish. It’s usually a good idea for the netter to reel their line in when they’re netting. This prevents rods from going over the side of the boat and tangles. Beckman Nets have been around for a long time, and almost anyone who has tried a Beckman has liked it. The fish like them also, as the bag of the net is easy on the fish’s eyes and skin, which greatly increases their odds for survival if they’re released. Best of all, Beckman nets are fisherman-friendly. They can be stored out of the way until needed, but when needed, they can be snapped into a landing position quickly. When you’re on the water this year, net your fish. You’ll end up catching more fish with less damage to the fish and to your hands.